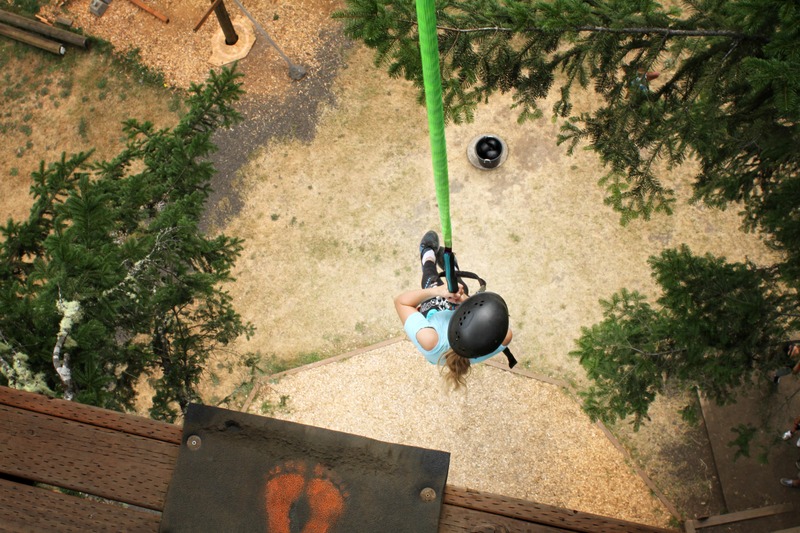 Come enjoy a variety of outdoor activities at Tree to Tree Adventure Park located in the beautiful forest surrounding Hagg Lake in Gaston, Oregon, less than an hour away from Portland. Tree to Tree opened in May 2010 and was the first aerial adventure park of its kind on the West Coast. Besides our thrilling zip line canopy tour and aerial obstacle course adventure, check out our mini treetop adventures that are sure to get your adrenaline flowing. For an adrenaline-pumping thrill, take our Treetop Plunge. Climb up to the platform situated 65 feet in the air and make a leap of faith. You’ll be attached to a device that lets you free-fall 20 feet before it slows you down and gently brings you back to the ground. Are you brave enough to take the plunge? Participants must weigh between 50 and 250 pounds for this outdoor adventure. Click here for more information. 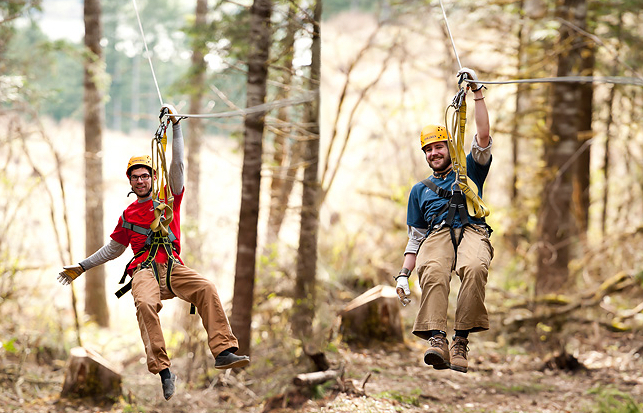 Get ready for some friendly (or not so friendly) competition on our tandem racing zip lines. This adventure features two zip lines parallel to each other, identical in length and height, that let you and another racer shove off at the same time and descend side-by-side at lightning speed. It's a race to the finish line, and may the best man or woman win. This adventure can only be done as an add-on to the aerial obstacle course. Can only be done as an add-on to the Aerial Obstacle Course. Act like a monkey in the Monkey Grove. 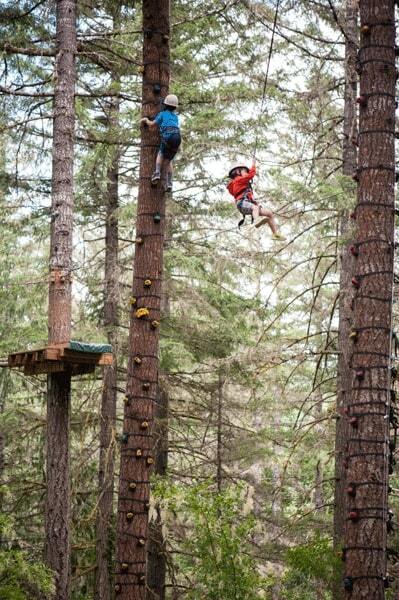 This fun-filled activity is comparable to rock climbing, but it's on trees. We have three different trees available to climb. You can experience the thrill of climbing straight up a tree as high as you'd like (up to 40 feet) and jumping off. All the while, you're safely attached to an auto-belay system that slowly lowers you back down to solid ground. The Monkey Grove is suitable for participants weighing between 35 and 300 pounds. Get the best deal on the biggest adventures by purchasing a combo package, including our All Adventure park pass, Zip Tour Triple Play Package, or the All Adventure Park Pass for all day fun and extreme adventure. Our aerial adventure park is open from March to mid-November, rain or shine. Reservations are required and available on a first-come, first-served basis, so book online or contact us at (503) 357-0109 to schedule your adventure today.